I love to make Pendulums! The slide show to the left displays a few favorites I've made throughout the years. I create custom orders and tune into your energy/essence to make specific ones tailored to you personally. I tune into your energy and essence to create a pendulum that is designed especially for you. You receive a pendulum made for your soul beauty. Pendulums are used for a variety of purposes. One of the most common usage is for healing work, such as to clear and balance chakras, energetic bodies and spaces. Other examples of their effectiveness are for reading space and connecting to the specifics of a situation or problem. They can also be utilized similarly to kinesthetics. Many Geomancers, Holistic Wellness and Feng Shui Practitioners incorporate them in their work and use them as tools in their practice. For more information on background, usage and care -- please refer to my Pendulum Info Sheet below. I've made different styled pendulums over the years, including ones for specific energy connection and healing when connected to the gemstone. 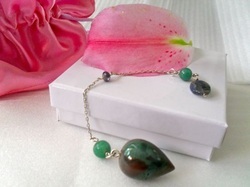 For example, the green jasper from the pendulum I've made for heart chakra healing here. They can be used for a variety of purposes not just for the gemstones qualities.